The digital world has the potential to re-energise the craft industry, giving scale and profile to individual artisans whose markets were previously limited to their immediate neighbourhood and allowing people with limited literacy skills to communicate using voice and image. India, a country with a 5,000 year artisanal legacy, has about 40 million people working in its creative manufacturing sector, both part-time and full-time. We also have a demographic dividend, or disaster, facing us, with 12 million young people entering the workforce every year for the next 15 years. The increased trend towards manufacturing automation implies big investments in manufacturing, but with an inverse relation to employment. The Government of India’s campaign to “Make in India,” leans heavily towards technology and automation led industries which do not increase the rate of employment significantly. Further, with machine learning and new voice technology, manned call centres and entry level data processing will become unnecessary in the not too distant future, taking away a large number of aspirational jobs from the first time services industry job seeker. On the other hand, the global demand for creative goods, now valued at $US400 billion annually, is growing in double digits, creating huge opportunities. In a hypercompetitive world, where quick refresh times are essential for market success, design is the key. Market driven creative manufacturing businesses that bring together business strategy, design thinking, execution, inclusive ownership and capital can be a decisive force to create employment, ultimately creating a new and gentler capitalism for more purposeful lives. Traditional, local and labour intensive craft based manufacturing has the capacity to deliver large employment numbers and meaningful work when it engages efficiently with modern markets. Relatively frugal capital expenditure, tooling and low energy costs allow for more jobs to be created with lower capital investment, and a smaller environmental footprint. By bringing together the SME (small and medium enterprise) and microbusiness sector of India with the artisanal sector it is possible to form creative manufacturing businesses, both SMEs and micros that bring the benefits of appropriate scale to what is currently individual, home based work that cannot take advantage of modern processes like lean manufacturing to increase productivity. Creative manufacturing requires constant engagement by the artisan in a dance of the eye and hand that cannot be easily replaced by robots or industrial production techniques in the near future. Furthermore, there is an almost visceral connection that customers have for the handmade, and this is increasing as our environments become more and more artificial and synthetic. Mobile phone penetration is ubiquitous in India; more and more content is being delivered through phones, especially smartphones where prices have dropped to about £40. A little known company in Uttar Pradesh has introduced what they claim is the world’s cheapest smart phone for 251 rupees, or £25! Dubious as that price point maybe, it does indicate rapidly falling costs for mobile connectivity. E-commerce in India is leapfrogging to mobile first and mobile only platforms. Industree Foundation, where I work, has developed a beta version of an e-commerce store front for creative manufacturing enterprises run by women. 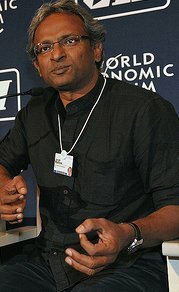 This has been made possible by funding from a mid-sized Indian software development firm, Sonata Software; through its corporate social responsibility programme (all Indian companies above a certain size are required by law to invest 1% of their revenues in corporate social repsonsibility programmes). Over the next three years the store front will expand to become a platform where artisan enterprises can track orders and customers can see exactly where and to whom their money is going. Many artisans face a big difficulty in raising working capital, so the platform will also include a crowd funding app. Another solution that was demonstrated recently was an app that connected artisans to raw material dealers. Digital technology is already removing layers of middlemen, bringing artisans closer to their end customers and increasing their incomes. Along with the government’s drive to encourage bank accounts for all, it is also making payments more transparent and trackable. But perhaps the most exciting use of technology will be in the near future, when customers and buyers can design exactly what they want in collaboration with artisans. Currently a lot of such co-creation requires face-to-face meeting and working. Although collaborative software tools have been around for a few decades, relatively few people have had access to them. Mobile and cloud technology will soon make them much more accessible and affordable. The precursor to this is the explosion in the use of Whatsapp to convey everything from colour (something is better than nothing! ), design, purchase orders, proof of payments and shipments and to do it all visually through images rather than requiring text to be keyed in. India uses Whatsapp as an essential business tool; much like Word and Excel is used elsewhere in the world of organised business. Industree Foundation is the non-profit part of a hybrid that includes a for profit company.